Luxury Holiday Villa. Magnificent Sea & Mountain Views. Near Uig, Isle of Skye. Not just another 'Holiday Home', but a real 'Home from Home'! Welcoming you in warm Mediterranean colours inside and out, Princes Point Villa provides spacious family accommodation for up to 8 adults and two infants. Magnificently situated between the north Skye shoreline and the hills of the Trotternish Ridge, the Villa enjoys a quiet secluded location in a friendly, rural, crofting community. Every window offers stunning views of Skye scenery. The main first-floor lounge and all four bedrooms have sea views. Sunsets over the Outer Hebrides from the picture windows of the upstairs living room have to be seen to be believed. The Villa is generously proportioned and includes two lounges, so there is plenty of space for everyone to relax. The Villa is comprehensively equipped to a high standard throughout you'll want for nothing! All 'mod cons' have been provided including Sky satellite TV in three rooms, Freeview in others, free unlimited BT Broadband with wifi, PlayStations 2 & 3, good Hi Fi and many other amusements, including a football table. Wildlife abounds and the lounge viewing scope offers the chance to get 'close up' to whales, porpoises, basking sharks, otters, eagles and other Scottish wildlife... as well as neighbouring sheep and Highland cattle. Outside, the house has a safe and secure lawned garden enjoying both fabulous sea and mountain views. There is a fully equipped gas Barbecue with a shelter and an outside dining area perfect for dining 'al fresco' on Long Skye summer evenings... the sun doesn't set until almost midnight. Whatever your holiday interests and plans, there is so very much to see and do locally without the need to travel far.... it is magical part of the world. I'm Andy Butler, chief factotum for Skye Holiday Rentals and I look after five lovely self-catering properties here on the beautiful Isle of Skye. We are a small family business who have been involved in Tourism on the Isle of Skye for over 25 years. Our aim is always to please and ensure that you have a wonderful time with us here in this amazing part of the world. Quality and fun are always what we/I endeavour to achieve and we want you to go home delighted after your stay with us.... and come again! We have met so many lovely guests over the years, many of whom have become good friends and return to visit us year after year. We look forward to you joining our throng of Skye supporters! Princes Point Villa is in a superb location. Totescore is just a few minutes drive from the busy wee village of Uig with all it's amenities, and yet is a quiet and tranquil haven with magnificent sea views and no passing traffic... we fell in love with it! Not only is the location stunning, but the Villa is unique and very different from many of the traditional Skye houses. For a start, it is split-level which immediately gives it another dimension and character. For me, the winning features are light and space. There are windows everywhere giving a 360 degree panorama of the wonderful sea and mountain scenery. You don't feel as though you are in a house.... you feel like you are part of the great outdoors..... whilst living in luxury. We love the Villa.... and you will too! toilet, Situated on ground floor with whb & wc. Family bathroom with bath, shower over, toilet, whb and 'make-up' area on lower level. En-suite shower room with toilet and whb to Master bedroom. Separate toilet & whb on ground floor. Full oil-fired central heating throughout. The Villa is a superbly warm property.... even on the coldest of winter days. Quality bed linens provided throughout with 'spares' available in the airing cupboard. Also outside clothes line and indoor drying rack. Modern 'focal point' fireplace with remote control 'living flame' electric fire in family lounge. Traditional 'focal point' stove with remote control 'living flame' electric fire in dining room. Safe off-road parking for up to 5 cars. Unlimited BT Broadband with good 'streaming' speed. Quality towelling provided throughout with 'spares' readily available in the airing cupboard. The Villa has two lounge areas. The main lounge is situated on the upper level with picture windows over the sea. The 'Day Room' is adjacent to the dining room. Both lounges have large Flat screen TV's with SKY, DVD players, Hi Fi, Playstation, books..
Russell Hobs 'pour through' with 'Aroma' setting. Large cafetiere.Electric coffee grinder. Ground coffees and beans provided. Very comprehensively equipped with all 'mod cons'. Electric Hob & oven, fridge, freezer, drinks chiller, dishwasher, microwave, coffee grinder & maker, food mixer/ blender. Generous family dining area with fabulous panoramic views of the coastline and Trotternish Ridge. Adjacent to kitchen and family 'day room' to make for a very convivial dining experience. There are five good flat-screen TV's in the Villa.... First floor lounge, Family Day Room, Master Bedroom, Kitchen and Bunk Bedroom. SKY TV (multi-room) with 'Sports + Children's' package available in main lounge, family dayroom and master bedroom. Kitchen and Bunk Bedroom have Freeview. In the first-floor lounge, there is a Philips Surround Sound system on the TV and also a Philips CD/MP3 player. The Day room TV has a Sound bar with MP3 and Bluetooth playback capability. There are four DVD players in the Villa.... First floor Lounge, Day Room, Master bedroom and Bunk Bedroom. There is a stocked bookcase and an extensive range of maps, visitor guides, walking books, etc with information on Skye and the local area. There are two Sony PlayStations (with games), a 'Foosball' Table, Board Games, Cards,etc. There is an extensive and eclectic CD collection in the Villa. There are a number of soft toys throughout the house. There is an extensive collection of DVD's (most genres) including a great selection of 'Kids' DVD's. There are two Sony PlayStations in the Villa.... a PS2 in the Bunk bedroom and a PS3 in the Family dayroom. There is a good selection of games. 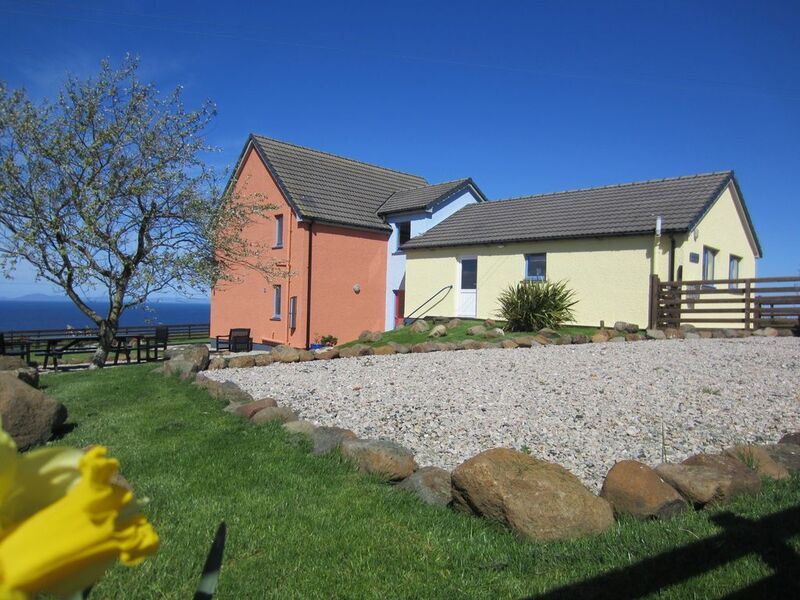 The garden enjoys magnificent 360 degree views.... sunsets across the sea to the Outer Isles and wonderful views to the east up to the slopes and cliffs of the Trotternish Ridge. The nearby Whitewave Activity centre offers daily canoe/kayak instruction. Hire can be arranaged locally. Local public slipway facilities are available nearby in Uig (3 miles) and Camus Mor bay (4 miles). The garden has a gravelled terrace with dining tables and chairs adjacent to the barbecue area. Wonderful sea and mountain views. The Isle of Skye has two good 9 hole Golf courses and both welcome visitors. The nearest is Skeabost (a twenty minute drive) and further afield at Sconser (40 minutes). Both are in lovely locations. Wish all holiday lets were like this! We stayed here for a week in April. We have stayed in many holiday lets over 30 years and nothing comes close to the attention to detail that this place offers. Andy (the owner) has thought of everything thing! I mean everything! Even down to paracetamol and plasters in the bathroom cabinets! The welcome pack was out of this world. Never seen a bowl of fruit quite so big! The house was spotlessly clean and smelt lovely as you walked through the door. It’s really spacious with so much to look at. Especially loved the wall art. Lovely views from the many windows. Nice and warm at all times. Quality equipment. Very peaceful. Even the run up to the holiday Andy was a delight. His witty responses to my messages were a joy! We met him mid week and he’s a lovely man. He certainly knows how to look after holiday makers. Absolutely spot on. I take my hat off to you Andy! Highly recommend, I will be telling all my friends about this place! I gave.a comprehensive assessment last weekend. Amazing location, great ‘home away from home’! Greetings from a cosy fireside here on the northern tip of Skye. I TRUST this finds you all well and enjoying yourselves on your 'Highland Fling'! I hope that Santa found you and was good to you! THANK YOU so much for staying with us at PRINCES POINT VILLA and for your super review. I'm thrilled that you enjoyed yourselves. Have a great Hogmanay and my very best wishes for a happy 2019. Andrew Butler, SKYE HOLIDAY RENTALS LTD.
PPV is simply the best. You name it PPV has it - If booking a holiday you would only have to bring with you clothes and small amount of food as the local shop is very well stocked. We would definitely choose to stay at the property again. Thankyou so much Andy - you have thought of everything to ensure we had a wonderful and memorable holiday in the Isle of Skye staying at PPV. We arrived after a long journey to find this lovely house all warm and cozy, lights on and welcome pack and treats left out for us. First and lasting impression that this is one of the most comfortable and best equipped holiday homes we have ever stayed in. The views out of all the windows are lovely. The house is accessed via a no through road off the “main” road so no passing traffic and very quiet. We were out every day exploring different parts of the island so cooked in most evenings. The kitchen is a great shape for that as the cooks can get on with creating while the others can sit at the long table or the tv lounge bit. We had a nice meal at the Uig Hotel but we were always pleased to be back at our holiday home! Andy was very helpful during booking process and kept in touch during our stay. No hesitation in highly recommending this property . Many thanks for your supper review of PRINCES POINT VILLA. We are thrilled you had a good holiday and enjoyed the house. We agree... it is a rather special place to be! Do come come and visit again. The house was beautiful both inside and out. Everything needed for cooking, relaxing and simply enjoying the view, was provided for . The welcome pack was beautiful and much appreciated. The house was in the ideal place for those who were looking for a relaxing family holiday. Lovely views from the windows and a quiet place very safe for children and the dogs. Lots of interesting places to visit within easy reach. We visited Staffin, the Fairy Glen and Waterfalls, Coral Beaches and Dunvegan Castle and Neist Point. Fished several times off Uig pier and caught lots of Mackeral which were mostly fed by mistake to the resident seals. In spite of the wet weather we had two good sunsets which is an important part of our holiday. The only thing I felt would have helped was a third shower. with 10 staying it was hard waiting to take our turn. A really lovely place to stay.. I hope this finds you well and recovering from you Skye adventure. MANY THANKS for your kind review of Prices Point Villa, I'm so glad you all enjoyed the house and had a great time exploring Skye. You certainly did get around. You are so right evening sunsets do more than make up for passing rain showers and they are wonderful from the upper lounge or garden... my favourite time of day! Whilst you were having cooling showers on Skye, I was in the parched brown Staffordshire countryside where it hadn't rained for three months... I know where I'd rather be! I'll look out for a very well fed seal on the Trotternish shoreline and send him your best wishes (or should that be 'fishes'). My thanks & best regards to you and all....do come and stay again! The nearest sandy beach is at Camus Mor which is a 10 minute drive from Princes Point Villa. A slightly further drive (20 minutes) takes you to the magnificent broad sweep of Staffin Bay and sands. Both are lovely and they also have public slipways for boat launching. Princes Point Villa can be reached the Citylink bus services from both Inverness and Glasgow terminate at Uig.... to connect with the Calmac Outer Isles ferry. Once here, there is an excellent local bus service running daily (except Sundays) which will get you around Skye. Princes Point Villa is about 250 miles (400km) from both Glasgow or Edinburgh and the car journey will sensibly take between 5 and 6 hours. Inverness is 120 miles (190km) distant and the drive takes about three hours. Uig Village & Ferry Port (shops, petrol, pubs & restaurants) - 2 miles. Princes Point Villa is situated on the north-eastern peninsula of Skye - called Trotternish. We believe it to be the most beautiful part of the whole island..... it has everything! The coastline is simply stunning from the broad sweep of sands at Staffin Bay to the dizzy heights of the famous cliffs at Kilt Rock. There is something to discover along almost every inch of the coastline and nearly all of it can be walked. The Rubha Hunish headland at Duntulm on the very northern tip of Skye is among the most beautiful and dramatic places in the whole of the british Isles. It's also a great place for whale watching! The 'back-bone' of the peninsula is the Trotternish Ridge which runs from Portree to Duntulm in the north and can be walked for all of it's 20 miles. It is acclaimed as one of the best and most dramatic long walks in Britain. Along the Ridge is the famous rock pinnacle called the 'Old Man of Storr and then above Flodigarry, are the renowned pinnacles of the Quiraing Mountain.... featured in many movies including 'Highlander'. So, the walking is just wonderful and almost unlimited..... dare we say......better than the Cuillins! There is so much to do in Trotternish and so many ways to enjoy your Skye holiday. There are fascinating museums, famous Dinosaur finds and footprints, crofting community recreations, ruined castles, deserted mines and villages.... the list is endless and will keep you more than busy. The two main villages are the ferry port of Uig and the crofting village of Staffin. Both are thriving little communities with pubs, restaurants, wee tea rooms and a warm Highland welcome! The award-winning ales of the Uig brewery are never far away. You can hide away on deserted beaches, watch otters, eagles and dolphins.... take kayak or archery lessons at the Whitewave Outdoor Centre....or just relax in the wonderful peace and quiet that is this timeless and special part of our world. If you are keen cyclists.... bring your bikes! Booking Notes: We request a £200 deposit when booking and the balance is due six weeks before arrival. Please visit Skye Holiday Rentals website for full terms & conditions including cancellation policy. Visa debit/ credit, Mastercard, Paypal, Bank transfer and cheques accepted. You can book and pay on-line from the Skye Holiday Rentals website or direct with Owners Direct/ Home Away. 'Altavaig' cottage at Flodigarry is another superb North Skye holiday home owned and operated by Skye Holiday Rentals - see property ref: SC2395 Changeover Day: For week (7 night) stays, changeover day is usually Saturday. Other days are available for Short Breaks and Christmas/ New Year holidays. Notes on prices: Discounts are available for stays of over one week... please contact us for details. All prices include linen/towels, electricity/fuel and VAT.